거북모양의 너럭바위 위에 세운 청암정(靑巖亭)과 마을 앞을 흐르는 석천계곡에 있는 석천정(石泉亭)은 유곡마을의 대표경관으로, 주변의 울창한 송림(松林), 계류(溪流), 아름다운 수석(水石) 등 자연경관과 조화를 이루는 뛰어난 명승지이다. 유곡(酉谷)마을은 1380년 충재 권벌의 선조가 처음 개척한 곳으로 마을모양이 금닭이 알을 품고 있는 ‘금계포란형’(金鷄抱卵形)의 지세라 닭실마을이라 부르게 된 곳으로 조선 중기의 실학자 이중환이 『택리지』에서 이 지역을 우리나라에서 손꼽는 경승지로 지적하였다는 기록이 남아 있는 역사문화 경승지이다. 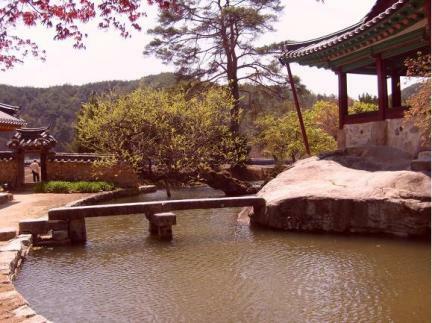 Cheongamjeong Pavilion, erected on a tortoise-shaped rock, and Seokcheonjeong Pavilion in Seokcheongyegok Valley, form part of the natural scenery along with the beautiful natural surroundings – including a dense pine forest and a stream dotted with large rocks – of Yugok Village. The place was first cultivated by an ancestor of Gwon Beol (pen-name: Chungjae) in 1380. It came to be called Daksil Village, as its overall shape is said to resemble a hen sitting on its eggs. In his geography book Taengniji (Ecological Guide to Korea), Yi Jung-hwan, a practical science scholar of the mid-Joseon Dynasty, introduced it as one of the leading scenic spots in the country.